By Tom Kertscher on Wednesday, March 30th, 2016 at 11:35 a.m. 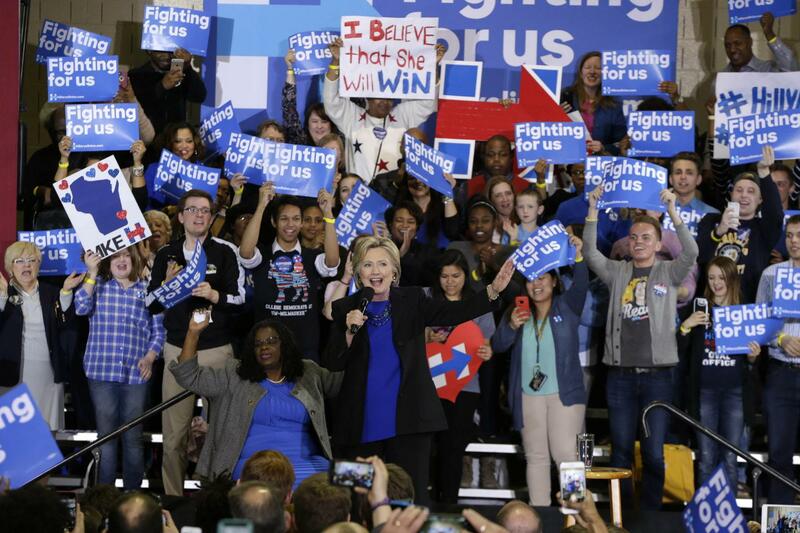 In one of her campaign stops in Milwaukee ahead of Wisconsin’s primary on April 5, 2016, Hillary Clinton made claims that drew contrasts between herself and the Republican presidential candidates, and between herself and her challenger for the Democratic nomination, Vermont Sen. Bernie Sanders. Here’s a look at six statements Clinton made in a speech on March 28, 2016, based on claims PolitiFact Wisconsin and PolitiFact National have checked previously. "Our economy does better when we have a Democrat in the White House." This statement in Milwaukee was broader than a claim Clinton made in July 2015, when she said: "The stock market does better when you have a Democratic president in the White House." PolitiFact National’s rating then was Mostly True. In September 2015, she said: "Under Republicans, recessions happen four times as frequently as under Democrats." That also rated Mostly True. When Bill Clinton was president, "incomes went up for everybody, not just folks at the top. Middle-class families, working families, poor families." In 2010, Bill Clinton said passage of his budget bill in 1993 "led to an enormous flowering of the economy in America." PolitiFact National’s rating was Half True. The economy's improvement did accelerate after the 1993 Balanced Budget bill became law. Still, Clinton was exaggerating because economists said many factors played a role. And in Milwaukee in 2014, Bill Clinton said: "One-hundred times as many people worked their way from poverty into the American middle class" during his presidency compared to Ronald Reagan's presidency. Our rating was Mostly False. The Republicans "won’t even admit climate change is real." In 2014, when Democratic California Gov. Jerry Brown said "virtually no Republican" in Washington accepts climate change science, PolitiFact National’s rating was Mostly True. But in February 2016, when Sanders said "not one Republican" presidential candidate "has the guts to recognize that climate change is real," our colleagues issued a rating of False. At that stage of the campaign, Jeb Bush, Chris Christie, Carly Fiorina and John Kasich had said it is real, it's man-made, and had have offered support for actions to deal with it. Bernie Sanders "voted against the Brady bill five times. He voted to give gun makers and sellers absolute immunity — immunity." Our colleagues have also rated as True Clinton’s assertion that Sanders "has reversed his position on immunity" for gun manufacturers and sellers. "We’re going to quit letting the government make money off of lending money" for student loans. Warren said: Student loans from the federal government issued between 2007 and 2012 are on target "to produce $66 billion in profits for the United States government." Our rating was Half True. Warren accurately cited an estimate from a Government Accountability Office report, but that estimate was made with an accounting method that the Congressional Budget Office says is misleading. As the CBO pointed out in another report, using that accounting method, student loans are projected to generate $135 billion in "profit" from 2015 to 2024 — but using the CBO’s preferred accounting method, they are projected to produce an $88 billion loss.